The funny thing about my visit to the La Crema tasting room at Saralee's Vineyard is, I wouldn't have been so critical upon reading their website description of the place afterward if I hadn't already really enjoyed an informative tour there. "The legacy of this historic barn continues as it is transformed into a multi-level tasting room for La Crema," the technically accurate copy reads. What's left out is what's filled in on a tour of the "barn" and a bit of the 265-acre estate. Situated a few stone's throws south of the La Crema winery, which has always been more of a workaday production facility than a winetasting destination, Saralee's Vineyard was founded by Richard and Saralee Kunde in 1989—although in a mini-mural upstairs, they paid homage to earlier owners of the property. 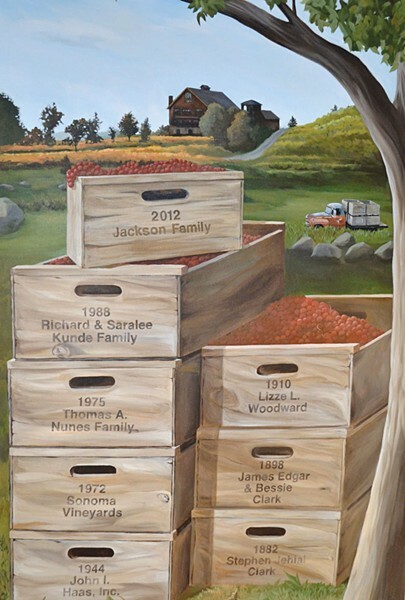 In 2012, they sold to Jackson Family Wines, which added their name to the fruit-crate roster. The historic barn had already been transformed into a cozy, if expansive, house by the Kundes, who were beloved in Sonoma County for their philanthropy and entertaining across the decades. Richard, a member of the Sonoma Valley family of Kunde Winery, bought a small nursery called Sonoma Grapevines in the 1980s and became an influential supplier of quality vines for countless California vineyards. Saralee McClelland Kunde grew up in the dairy country of Petaluma, and made that heritage part of her style by collecting numerous, often kitschy cow-related gifts that friends gave her over the years. To the credit of the staff at La Crema, they've not only preserved many details of the Kundes' former residence, but put a few photos on display of how it was. Now it's a thoughtfully designed tasting room in the contemporary trend. Visitors are greeted at the front counter and directed to their appointment, or to a tasting room in the back that was the Kundes' library. The estate wines definitely show their difference. The 2014 Saralee's Vineyard Chardonnay ($45) invites a lemon meringue comparison to the rather wispy set of other Chards, and the 2014 Saralee's Vineyard Pinot Noir ($55) murmurs about spicy, raspberry herbal tea, while the 2015 Russian River Valley Pinot Noir ($40) boasts, shyly, about vanilla, raspberry and cola. The Jackson folks are more than eager to show off their Oregon acquisitions, so you'll find plenty of offerings from up north. But the smoky and brooding 2015 Los Carneros Pinot Noir ($40), I'm told, won't put off the occasional visitor who demands, "So where's your Cab?" La Crema Estate at Saralee's Vineyard, 3575 Slusser Road, Windsor. Tasting fee, $15–30; tour, $65. 707.525.6200.